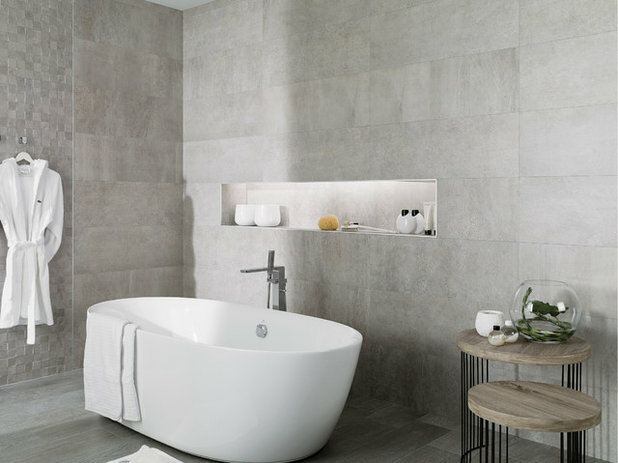 No longer reserved for industrial or ultra-contemporary homes and additions, concrete is seducing more of us by the day and convincing us to put this hard-working material to use in and outside the home. 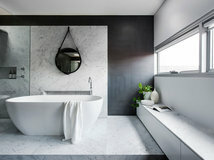 Kitchens have been showing off concrete in smart and sophisticated ways for some time, but bathrooms are quickly catching up – and it’s hard not to be impressed with the results. 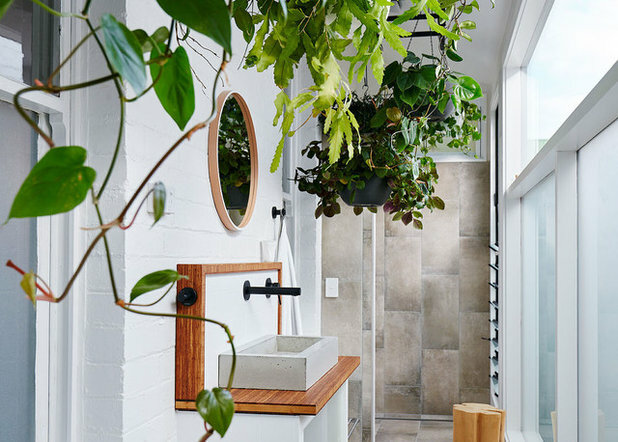 These inspiring bathrooms will help you decide how far to go with concrete – will you use just a little or a lot? 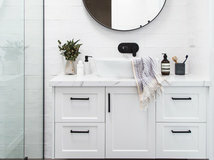 A concrete vanity benchtop is all a bathroom needs to rise to the top of the style stakes no matter what the design of your bathroom. 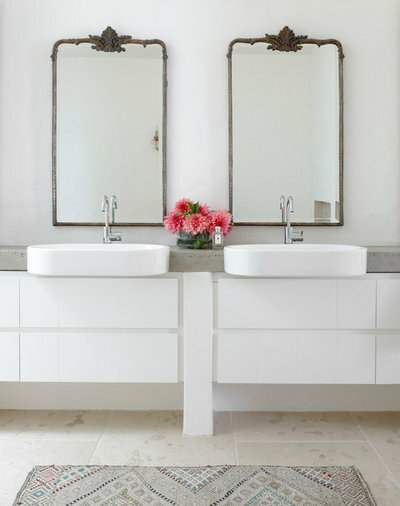 This bathroom manages to mix traditional (the mirrors), with contemporary (vanity, tapware and flooring) and industrial (benchtop), and does so with confidence. The take-away? Don’t be a slave to a particular style. 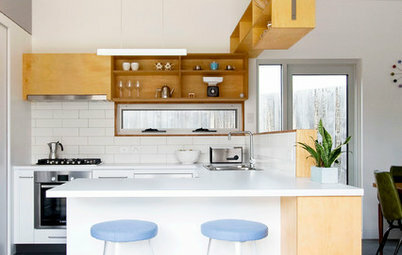 Tip: If you’re thinking about selling any time soon, rest assured that potential buyers will lay their eyes on that concrete benchtop first, and be suitably impressed. 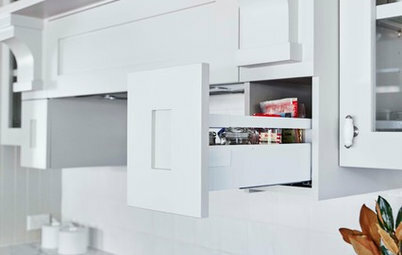 As for kitchen benchtops, concrete vanity benchtops are typically made with glass-reinforced concrete to reduce the weight and provide the internal structure concrete needs without resorting to steel reinforcement used in traditional concrete applications (walls, floor slabs). Known as GFRC, or glass fibre reinforced concrete, it can be moulded into just about any shape you like. 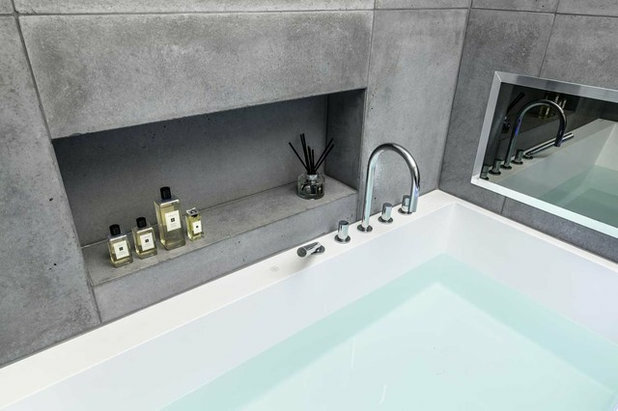 Bringing concrete into the bathroom needn’t involve features that are custom-made or poured on site. 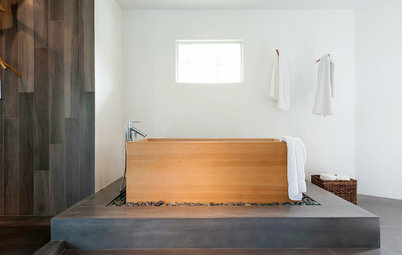 Companies such as Wood Melbourne hand-make concrete basins and taps for use in settings like this. 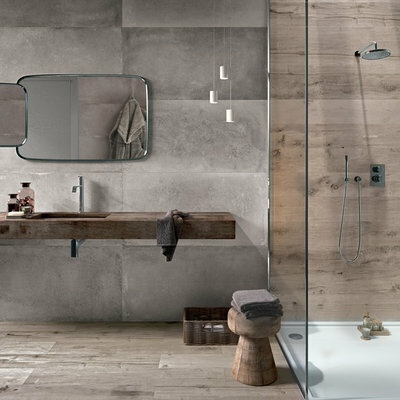 Paired with timber, concrete comes into its own. 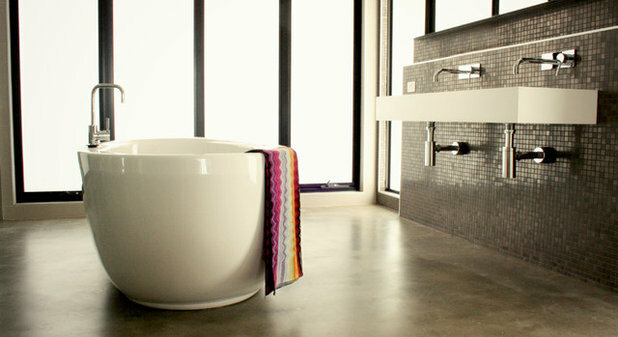 Concrete bathtubs can be custom built to fit neatly into your bathroom, no matter what its layout or dimensions. 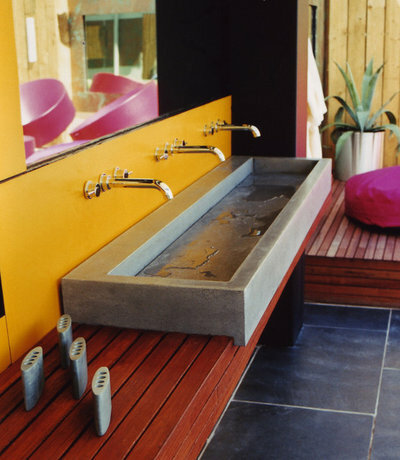 Basins can, of course, be moulded seamlessly into the benchtop – that’s the beauty of concrete. 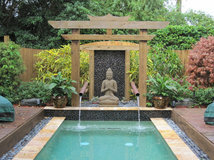 Tip: While the texture and patina of concrete is appealing, it is also porous in nature. 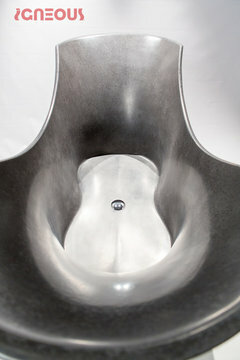 Without penetrative sealing, concrete basins can stain and look unsightly over time. 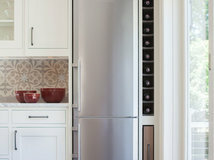 To keep the seal in tact, use a pH-neutral cleaner and avoid abrasive scrubbing. 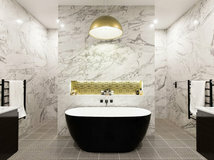 … or something smooth and contemporary. 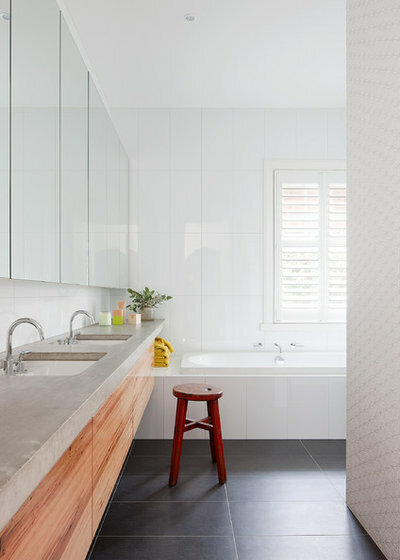 Texture can be added where you want it with the help of small-format tiles like the Mosaico Rodano Acero tiles laid on the wall to the left in this bathroom. 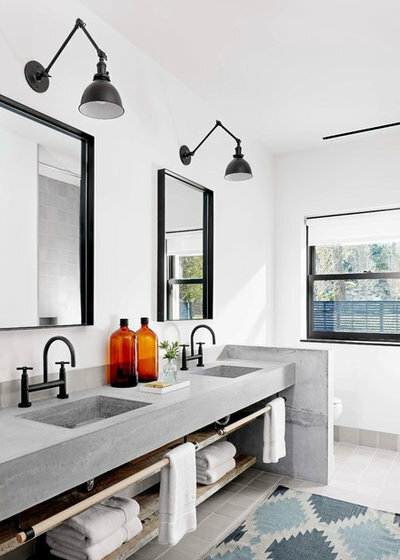 If you have polished concrete floors in much of the rest of your house, extending the same material into your bathroom can make for a seamless effect. 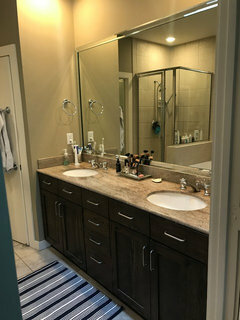 Concrete floors are easy to clean and, when there are no cabinets sitting on the floor as in this bathroom, running a mop over it is a breeze. 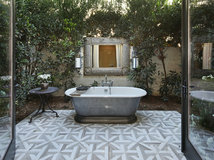 Encaustic cement tiles add character and warmth to a bathroom because of their texture – visually and beneath the feet – and pattern. Tip: Encaustic tiles need to be resealed about once a year, but porcelain encaustic-look tiles are now available that have the same artisan style and feel, without the need for maintenance. 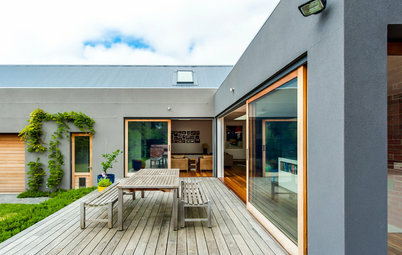 If all this grey, white and timber has you thinking concrete isn’t really you, think again. 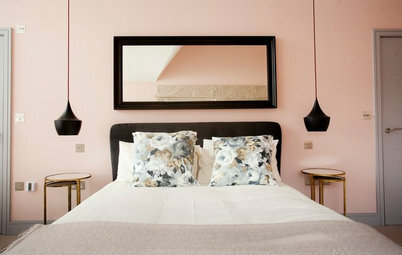 There’s no need to limit yourself to this common palette if bright splashes of colour are more your thing. 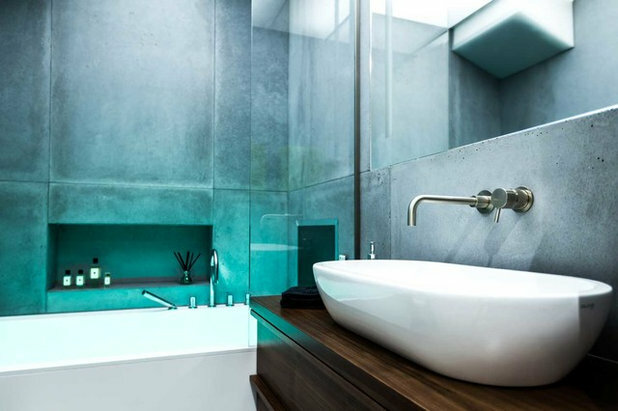 Concrete wall tiles, 20 millimetres thick, give this bathroom its raw edge, but adjustable mood lighting can add colour or warmth for times when it feels stark or cold. 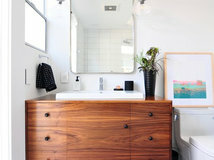 This stylish bathroom also features a waterproof in-wall TV so you can watch a movie while you’re soaking in the tub. Does life get any better? 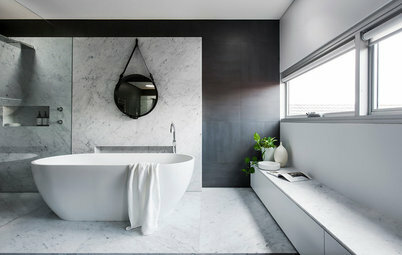 What do you think of concrete in the bathroom? Share your views in the Comments. We agree. 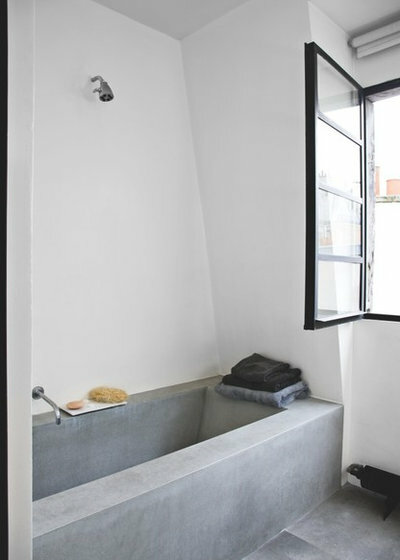 Concrete is a great material for bathrooms, especially tubs! 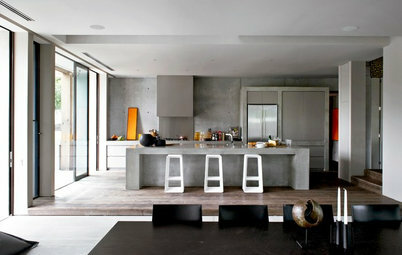 Not only is concrete cool, sleek and functional, it's also an on-trend grey! 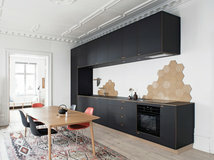 What more could you want for your kitchen? 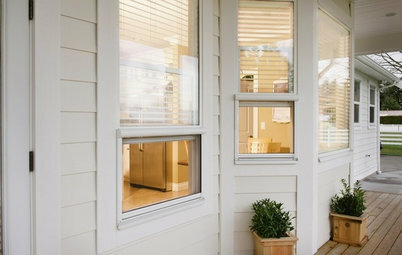 Decorating Not Enough Space in Your Living Room? Think Again!